The automotive aftermarket is a unique, multi-faceted and fast-paced industry and we strive to ensure that AAG is a dynamic, forward-thinking organisation for our employees. As a rapidly growing company, we strongly encourage promotion from within, enabling fast career development to leadership roles. Find out about our employee benefits and explore our current vacancies. With over 8,500 employees across Europe, we have a variety of roles that cover a vast number of functions. We invest in a wide range of benefits, including staff discounts, pension plans, and childcare vouchers to ensure that our employees feel well looked after and appreciated. We offer our employees extensive training options and always look at internal promotion opportunities. Alliance Automotive France is a progressive and fast-paced business that offers diverse job opportunities to its employees. With a focus on developing their employees, AAG France support them to make the most of their skills. Visit our careers site to view our current vacancies. 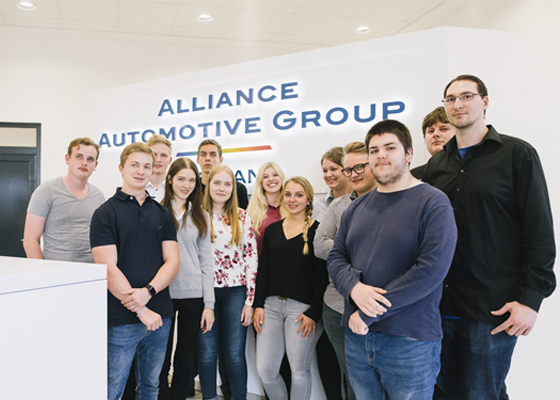 A career at Alliance Automotive Germany GmbH could offer you a compelling international career opportunity. As an organisation that appreciates the commitment of each individual, we can also provide exciting development opportunities. Visit AAG Germany’s career portal to view our current vacancies.